Rangers' James Costello fired in another two on Saturday. A double from James Costello clinched another crucial three points for Rathfriland Rangers as they eased past 1st Bangor Old Boys on Saturday. The Whites striker scored a goal in both halves to keep his side on top of NAFL Division 1A and with rival sides Lisburn Rangers and East Belfast also winning, the pressure of the title run-in rises. Rathfriland Rangers full-back Jonny Black gets set to deliver a cross against 1st Bangor Old Boys. The opening 10 minutes of the game saw the visitors bombard the Bangor goal, and only for two superb saves the game could have been over as a contest having barely started. 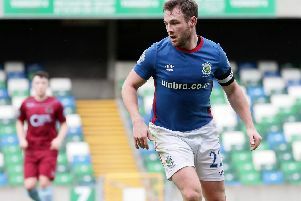 But on 16 minutes, Darren McGrath burst into the Bangor box before cutting the ball back for Costello to fire into the ceiling of the net from eight yards. Rathfriland pushed for another but Bangor sat deep and with men behind the ball they largely managed to repel most of the danger that came their way. Bangor did have a positive spell in the final eight minutes of the half, having the better of the possession and the territory, but they couldn’t make it count as Rathfriland’s impressive defence - the tightest in the league all season - dealt comfortably with anything that was thrown at it. Thomas Lockhart on Rathfriland’s left wing was a constant headache for the Bangor defence, and he twisted and turned his marker and the centre-half incessantly. And he earned the Whites a penalty when he was scythed down inside the box just before the hour mark. Costello stepped up to add to his opener in the first half and make the game safe. The game was hardly a classic but the Whites were efficient and did not let anything trouble them. Sterner challenges will undoubtedly arise but another victory in the bag keeps Rathfriland’s destiny in their own hands. Rathfriland Rangers: Shane Harrison, Chrisy Havern, Conor Larkin, Aaron Black, Jonny Black, Darren McGrath, Conor Fegan, Ross Black, Thomas Lockhart, Marty Havern, James Costello. Subs: Nathan Baird, Josh Buchanan, Jake Redpath.